Decomposed Granite is usually tan in the pile, but once it packs and settles appears pinkish in color. The material is 1/2” in size down to fines. 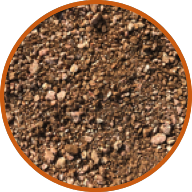 This material packs down well, and is commonly used for pathways and in landscaping for that desert style look. See the side of our building for the material in action as a pathway. If you live outside of the city, chances are you might need to do some repairs to your septic tanks lateral lines. If that's the case, this material is perfect to back fill around the pipe, allowing the water to weep out. The material is about 2” down to 3/4” in size. It can also has other applications depending on the project, such as back filling behind retaining walls, or filling bigger holes in a driveway. 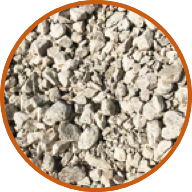 This material consists of crushed, recycled concrete aggregate ranging from 1 1/2” in size, down to fine powder and contains all of the stone sizes between. 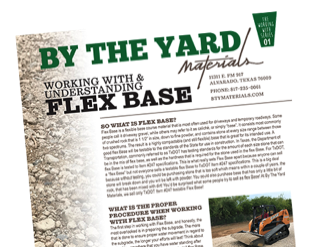 It meets the specifications for TxDot approved base course works great for construction sites as well as residential applications such as driveways. Take a look at our lay down yard to see this material in action. A lot of people are concerned about rebar in the material since it is recycled, but as you can see from the pile and our lay down yard, the material is good and relatively clean. This material is screened 1" to fines in size, but typically you won't find much of the bigger size stone in this material. It is best for topping flex base driveways as the summer heat and continued driving cause the material to compact tightly making a good surface that is considerably cheaper than Asphalt Hot Mix. 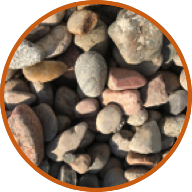 2”-3” River Rock is yet again another native Texas stone, where all stone is mainly 2”-3” in size. Color spectrum is typically white, cream, tan, brown with a hint of additional color. 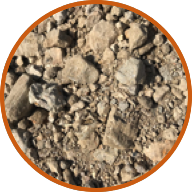 This material is not as smooth and round as the Colorado 2”-4” that we carry, but still works great for those looking for the native Texas look in their landscape. This is a native Texas stone that is round and about 3/8” in size. This native material is primarily brown, tan, and cream, with a hint of additional color. 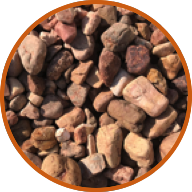 2”x4” Colorado River Rock is an imported Colorado stone, The size is just as stated at 2” - 4” in size and is primarily blue and mauve with a hint of additional color. 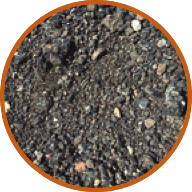 This material would commonly be used in flower beds and landscaping where a larger stone is desired. It does contain some smaller pieces. This is an imported Colorado stone that is round and about 1” or 2” in size. This material is primarily blue and mauve in color with a hint of additional color. 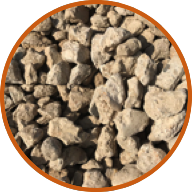 This material would commonly be used in flower beds and landscaping where a medium size stone is desired. 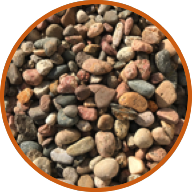 3/4” Colorado River Rock is an imported Colorado stone, The size is primarily 3/4” in size and is primarily blue and mauve, with a hint of additional color. 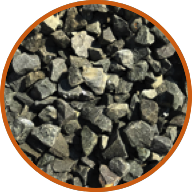 This material would commonly be used in flower beds and landscaping where a smaller stone is desired. 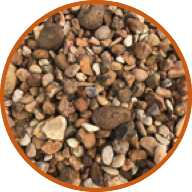 Our Cherokee River Rock is imported from Oklahoma and ranges in size from 2" to 1/2". 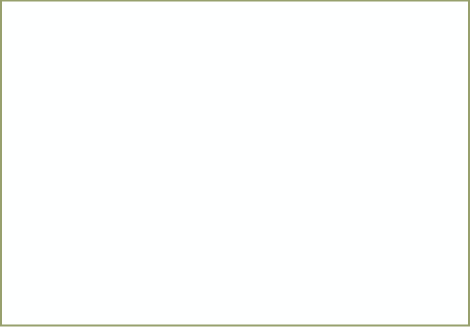 It is primarily mauves, tans, browns, and creams in color. 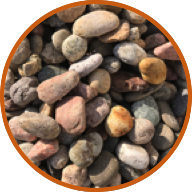 It is a beautiful stone that can be used in flower beds and decorative areas. Our Texas Black Stone is 1 1/2" to 3/4" in size and is a rich dark gray in color. The black in the name sake comes to life once the stone gets wet. It is a great addition to flower beds and decorative stone areas. 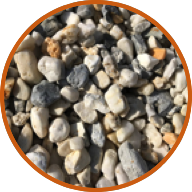 Our Salt & Pepper River Rock is 1 1/2" to 3/4" in size and is white and cream in color with some dark gray and blue stones with an occasional darker yellow stone. It is a great blend of color and at a distance brings to mind salt & pepper. It is great for flower beds and decorative stone areas. 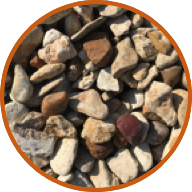 Our Mountain Verde Stone is a one of a kind crushed stone with colors ranging from Tans, Browns, Creams, Crimson and even some beautiful Green Shades. This stone looks great in flower beds and decorative gardens. Size range is 3/4" to 2" in size on average. 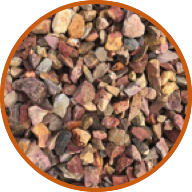 Our Rose Tricolor Stone is another one of a kind crushed stone with colors in the Creams, Crimson and Tan families. 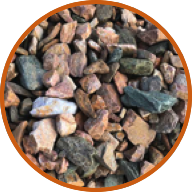 This stone looks great in flower beds and decorative gardens. Size range is 3/4" to 2" in size on average. 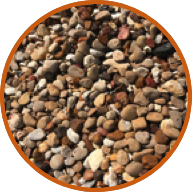 Our 2x4 Texas Cafe River Rock is rich in Tans and Browns with some slight additional color. Its rich color lends well to native rockscapes, flowerbeds, and decorative stone areas. Size range is primarily 2"x4" with some smaller and some larger pieces.